The retention of 'local' hospital services has been a contentious issue in most countries including New Zealand . Local retention of services is a geographical access issue, and the major tension is between the cost of providing hospital services from small relatively isolated facilities and the advantages in providing fewer large facilities with the capacity for providing more complex services. Locating health services, particularly hospitals, is always going to be contentious because facilities are visible symbols of local empowerment. Spatial modeling allows planning and policy development to consider a range of factors in the decision-making process, including where disadvantaged subpopulations may be under-serviced and/or whether there is identifiable inequities in geographical access. Recent improvements in computer power and the availability of Geographical Information Systems (GIS) data layers has opened up new opportunities for modeling accessibility. Even though least-cost path algorithms, such as those applied here, have been available in commercial GIS since the late 1980s, the application of these algorithms to large national data sets has only recently become feasible. This paper demonstrates how GIS can be used to model travel distance and time to public hospitals in New Zealand using 63 hospitals and approximately 38,000 enumeration census district centroids in New Zealand. These enumeration districts are call "Meshblocks" in New Zealand and are the most detailed census information that is available to the public. The approximate travel time and distance, based on using a private car, from each census centroid to the closest public hospital will be calculated. This paper will describe a GIS process to do this, comment on experiences, and demonstrate applications of such a result. The benefit of having travel time and distance to the closest hospital for each census centroid is that by multiplying the travel distance or travel time by the population of each census centroid, it is possible to calculate the approximate total and average travel time and distance if everybody visited a hospital once. 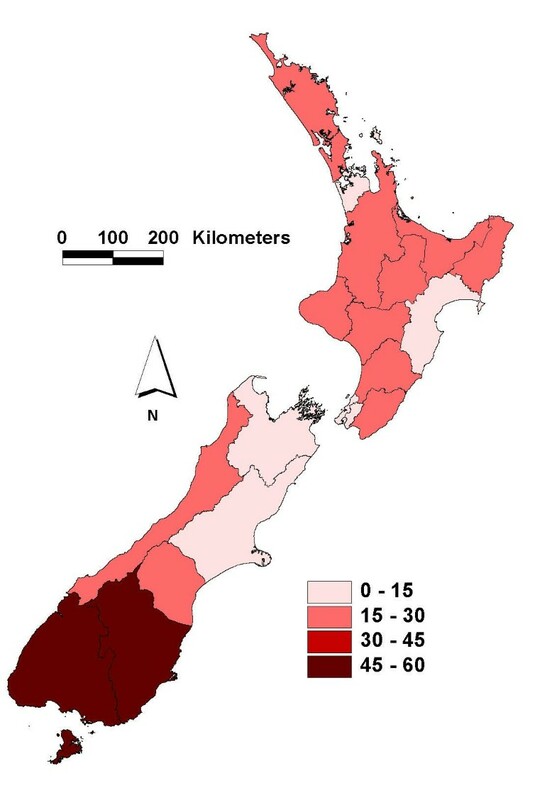 These statistics can be tabulated for different management areas such as District Health Boards (the Ministry of Health's regional management units – 21 in total) or Territorial Local Authorities (local Government – 75 in total) and provide a comparison of hospital accessibility for different regions of New Zealand. These indices of hospital access can be formulated in many different ways so that demographic groups in more need of health care, such as the elderly and the very young, are given extra weighting. 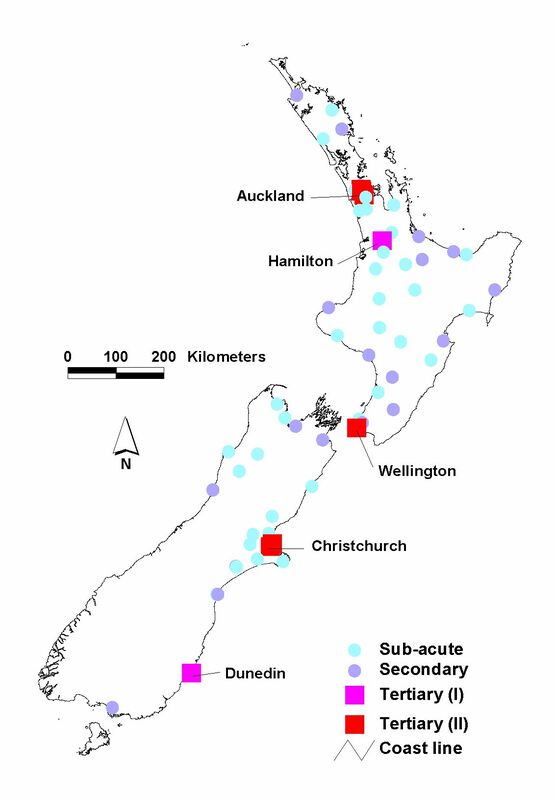 These indices can account for particular population groups requiring multiple visits per year and can be used to determine the social equity of the distribution of public hospitals in New Zealand. Hospitals are not homogeneous in the services they provide and this study analyzes accessibility to different types of hospitals. Obtaining a definitive classification of public hospitals in New Zealand is not a simple task. The Ministry of Health provides a "Hospital Service Plan" , which classifies and lists hospitals in New Zealand as sub-acute, secondary, lower-level tertiary or higher-level tertiary. This study uses the classification used in this service plan but added some additional sub-acute hospitals. Additional sub-acute hospitals were drawn from the latest licensing databases. The definition of sub-acute hospitals was that they have beds, provide medical/surgical facilities, and are funded/licensed via the District Health Boards (DHB). The total number of hospitals used in this study was 63. There were 8 tertiary (I and II) hospitals, 19 secondary hospitals and 36 sub-acute hospitals. The locations of these hospitals were manually entered and are shown in Figure 1. Accessibility to the closest hospital was first calculated for all the hospitals and subsequently calculated for only hospitals classified as secondary and above, and then just tertiary hospitals. The development of this accessibility model is based on many assumptions that are described and substantiated in this paper. Hospitals used in this Study and their Category Four different types of public hospitals were used in this study. The main cities in New Zealand are also shown. All the tertiary hospitals are located in these cities. It should be emphasized that geographical accessibility is but one of many dimensions in the accessibility of health care. Other dimensions of accessibility, identified by the World Health Organization , are financial, cultural and functional dimensions. Joseph and Phillips , in perhaps the seminal text on the topic of geographic patterns of health service delivery, present "locational" and "effective" accessibility as the defining components of any accessibility description. "Locational" accessibility refers to the physical proximity of the service. This measure is inherently geographical and can be measured using GIS processes. However "effective" accessibility is somewhat more complex as it includes opening hours of a service, social and financial availability of the service, and personal space-time budgets. These measures are more difficult to model using GIS and generally available data sets. Considering only the geographical access dimension, numerous models can be constructed. In addition to cost path models, such as used in this study, there have been a number of studies that have used Euclidian distance and Thiessen polygons. Kohli, Sahlen, Silvertun, Lofman, Trell, and Wigertz  used an areal distance measure in their small-scale analysis in the Ostergotland province of Sweden. Twigg  employed Thiessen polygons to model catchment areas of general practitioners. Zwarenstein, Kringe, and Wolff,  also used a Thiessen polygon based approach in the assessment of access to hospitals by different ethnic populations in Natal, South Africa. Perry and Gesler  used 5 km buffers to represent possible travel distance by walking one hour in their study of Andean Bolivia. This method did not take into consideration topology of land or use of networks of paths or roads. Road networks have a fundamental affect on accessibility therefore models based just on Euclidian distance and Thiessen polygons, although claiming objectivity, only provide a crude measure of accessibility. The use of cost path models has been less frequent than Euclidian distance and Thiessen polygons most probably because of the complex computation involved. Recent improvements in the computational power of desktop computers and the availability of data sets has enabled cost path models to be easier to implement. Lovett et. al. used GIS techniques to calculate accessibility to a range of primary health services (GPs, pharmacies and dental services) in East Anglia, UK. Separate travel times for both public transport and private car were included. The study used weightings for five different road types that would influence travel speed. It incorporated data on the actual GP that each patient was registered with, rather than assuming that patients would always choose to use the closest medical practitioner. In New Zealand, Critchlow Associates [10, 11] undertook two consultancies for the Central Regional Health Authority and the Southern Regional Health Authority that calculated the travel times to public hospitals within each of the commissioning regions. It classified the road network into three speed categories, based on existing Department of Lands and Survey Information road records. Public transport was also incorporated into the database. While these models provided a useful indication of access to public hospitals at a regional level, the passage of time and further restructuring of the public health sector since their publication has diminished their applicability. This paper demonstrates a geographic, cost path analysis model showing travel time and distance to the closest hospital. Three data inputs were used in the analysis: a national road network, census area centroids, and hospital point locations. Fortunately, the NZ Government has recently relinquished its demand for royalties for access to the national 1:50,000 topographic data set, which means that a comprehensive road network of NZ is now available to all researchers. This road network contains various information on road characteristics but does not contain information on travel speed or time for each road segment. A substantial part of this study was developing and verifying a road network with travel time, which is described later in this paper. To calculate travel distance, road segment length is required and this is easily computed with GIS. The census centroids were generated from Statistics New Zealand's 2001 census areas. There are approximately 38,000 census areas in the 2001 census release with an average population of 97 people. The unique identification number for each census centroid links these small areas to population census data, which facilitates demographic analysis. The network analysis capabilities in ARC/INFO 8.1 (Environmental Systems Research Institute, Inc) were used to calculate accessibility. The key command used was called nodedistance, which computes the distances between all possible combinations of origin and destination nodes. This command uses a least cost path algorithm, which is based on an algorithm generally credited to Dijkstra . The algorithm is described in ARC/INFO user manuals . In this study, the nodes closest to the census centroids were the origin nodes and the nodes closest to the hospitals were the destination nodes. The nodes closest to the census centroids and hospitals were identified using the near command, which also calculates the Euclidian distance to the nodes. The nodedistance command provides a table of minimum distances via a network between all possible combinations of origins and destinations. It also provides identification numbers of the origins and destinations for each record and the Euclidean distance. The nodedistance function does not only identify distances but can also be used on any specified field, such as travel time. To identify the closest hospital for a given census centroid the statistic function was used to identify the minimum distance for each origin to the closest destination. The minimum distance to the closest hospital for each centroid was calculated by summing the network distance (obtained from the nodedistance command and subsequent statistics) plus the distance from the centroid to the closest road node (obtained from the near command) plus the distance from the hospital to the closest road node (also obtained from the near command). The calculation of minimum travel distance to the closest hospital is made possible with some powerful commands in ARC/INFO. This process produces many output tables and the most difficult part of developing this process was linking all the tables through common identification fields so that the identified closest hospitals and their distances can be linked back to the census centroids. The process for calculating the minimum travel time to the closest hospital is similar to the minimum distance process except road travel time was used instead of distance. The difficulty with this process was determining what the travel times were for traveling along the road segments. The method for calculating this is described below. The travel times from census centroids and from hospitals to the closest road node were calculated using distance (obtained from the hospital-distance modeling process) and a travel speed of 50 km/hour. First, all hospitals (sub acute and above) were treated the same and the analysis calculated the travel distance and time to the closest hospital for each of the 38,000 census centroids. The processing time was approximately 8 hours using a 750 MHz CPU standard desktop PC computer. Accessibility to different types of hospital service was subsequently calculated by using just secondary and above hospitals, and then just tertiary hospitals. The estimated road network travel times were based on whether the road was inside or outside an urban area, whether or not it was a motorway, the number of lanes, the surface, and the bendiness (sinuosity) of the roads. Figure 2 shows the road network used and the estimated travel speeds. Urban roads were identified by integrating the road network with a landcover layer . Motorways were identified by using the field "name" and searching for the name "Motorway", and also by manually locating "open speed limit" roads in the Wellington and Auckland urban areas. The number of lanes a road has and the road surface were provided with the road layer. Sinuosity indicies have been used in hydrology for describing the meandering of river channels. A simple formula for sinuosity is observed length divided by expected straight-line (direct) length . GIS easily provides observed lengths of lines. The straight-line length was calculated for each road segment by creating a new road layer that was a generalization of the original road layer. This generalization involved removing vertices from the road arcs so that there was only one vertex per 500 m. This had the effect of straightening the road segments. The lengths of the straightened road segments were then calculated and joined to the original road network using the common ARC_ID field. The sinuosity index was calculated by dividing the original length by the straight length. If a road was originally straight, then the sinuosity index will be 1. If a road is bendy then the sinuosity index will be above 1. A very bendy road that turns back on itself (hairpin corners on a hill) may have a high sinuosity score of 4. A sinuosity threshold of more than 1.02 was used to identify bendy roads. 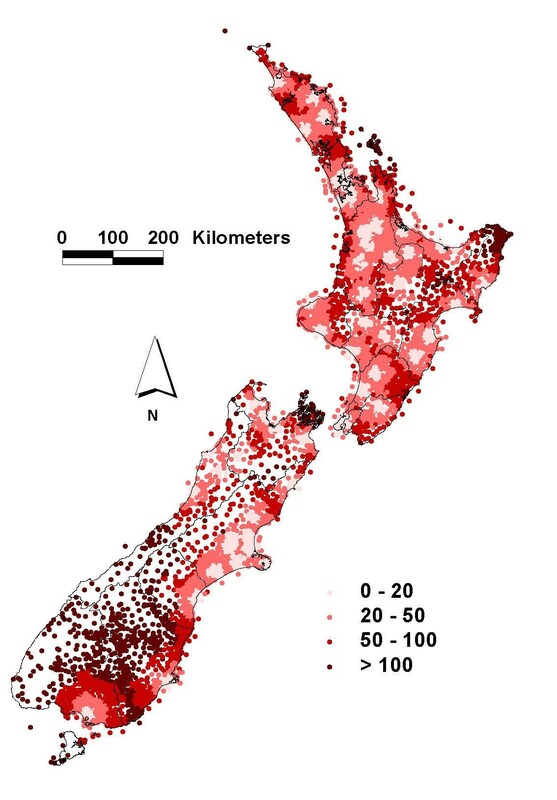 This threshold was determined by graphically viewing the sinuosity indices of roads in New Zealand and identifying what threshold was required to distinguish roads that are known to be bendy, eg. Rimutaka Hill, and Thames-Coromandel roads. This classification of road speeds was more detailed than that used by Critchlow Associates , which was based on only three classes of roads speed – 80 km/h for motorways and high-speed rural roads, 60 km/h for slow rural roads, and 35 km/h for urban and minor rural roads. The travel time study of GPs in East Anglia (UK)  used 12 classes of travel time, but because traffic and road conditions are different in the UK, it is not valid to compare them with NZ roads. The road segment travel times were calculated from arc lengths and estimated travel speeds. It needs to be emphasized that the road segment travel times are estimations only. The travel speeds for different road types are not based on scientific empirical evidence but instead on approximations based on an unsystematic sample. This process does not take into account urban expressways where average travel speeds could be more than 30 km/hr. It also does not consider the effects of traffic congestion and difficult intersection. The network distance and travel times also ignore one-way streets. These limitations mean that the research results are only useful for regional generalizations rather than providing insight on the exact travel time of individuals. Many census centroids are located on offshore islands or out at sea. These centroids are used to represent people on boats or isolated islands. The distance to the closest hospital from these centroids is based on the Euclidian distance to the closest road and the network distance along the road to the closest hospital. Sometimes the closest roads to these centroids were roads on islands that did not connect to roads near hospitals. This caused a problem that was resolved using two approaches. First road networks on large islands were connected to the main road network by an arc that represented a ferry service route. The travel times for these ferry routes were then estimated from timetable schedules. The second approach was to then delete all roads that were not connected to the main road network in the South or North Islands. The Trace and Nselect commands were used to identify these roads. The travel distance and time to the closest hospital for each census centroid are represented in Figures 3 and 4. These figures show the raw data that results from the analysis (the DHB boundaries are also shown). These results can be aggregated to many different regional management units, such District Health Boards (DHB). Each census centroid represents the usual residential (night time) population, which can vary from 0 to 768 people. The distance and time to the closest hospital can be multiplied by the population of the centroid to give the total distance and time traveled if everyone in the centroid visited the closest hospital once. These totals can then be summed for each DHB, and then divided by the usual residential population of each DHB to give the average distance and time traveled by each DHB if everyone visited the closest hospital once. Figure 5 shows the average travel time by DHB if everyone visited the closest hospital once. The shortest path by distance may be totally different to the shortest path by time because of the different travel speeds of the roads . The use of time and the interrelationship between space and time has an important affect on choice  so travel time is more important than travel distance. Travel Distance in Kilometers to the Closest Hospital by Census Centroids. The District Health Board Boundaries are also shown. Travel Time in Hours to the Closest Hospital by Census Centroids. The District Health Board Boundaries are also shown. Average Travel Time in Minutes to the Closest Hospital by District Health Board. The results from the network analysis are very rich in information and can be presented in many different ways. Careful thought needs to be given to what are the most important representations so that health planners are not overwhelmed with too many maps. As mentioned previously the results can be aggregated to different management units. It is arguable whether average travel times are the most appropriate statistic for comparing regions. The average travel time can be misleading because it does not consider the population effected by this time. A region may have a high average travel time but only have a low population. It is possible to present the total travel time for each region and use this statistic for a comparison. However, this statistic over represents populated areas, such as cities, where the average travel time is low but the total travel time is high because of the large population. A statistic that can be generated from network analysis is the population that is more than one hour from a hospital, as shown in Figure 6. The time threshold could be any time but one hour is a long time to travel to a hospital and seems a suitable threshold for comparing regions. The "golden hour" is a threshold that ambulance officers often talk about. People who have to travel more than one hour are paying a high cost (financially and emotionally) to visit a hospital and this should be of concern to central government. This statistic is easy to comprehend and provides a fair assessment of physical accessibility. It is also possible to compare the accessibility of elderly people. It can be safely assumed that elderly people need to visit hospitals on average more frequently than other age groups. When calculating total travel times it is possible to put extra weighting on elderly people. Using such weightings and statistics, it is possible to examine and display the social equity of hospital services. The analysis process calculated the distance and time to the closest hospital and identified the name of the closest hospital based on both distance and time. These can sometimes be different because of the variations in road travel speeds. The number of visits each hospital would receive if everybody visited the closest hospital once can be tabulated and a catchment area for each hospital can also be mapped. The analysis results and applications so far have been based on all the hospitals. Travel distance and time to just the tertiary hospitals, and secondary and above hospitals has also been generated using this process. The average travel times for all hospitals, secondary and above, and tertiary hospitals are shown in Table 1. This is a national figure for New Zealand and represents the average travel times if everyone had to visit these types of hospitals once. As expected the larger hospitals are less accessible. Also shown in Table 1 is the population more than one hour from each hospital type. It would be interesting to compare these statistics with other countries. The average travel times to the closest hospital and the population more than one hour from the closest hospital for all of New Zealand (by hospital type). The raw data produced from the cost path analysis can be applied in many different ways when combined with population data to produce many interesting maps and statistics, however, it is not appropriate to present many maps in this paper. The intention of this paper is to describe the process used to create the base results, rather then demonstrate applications. An atlas depicting accessibility of different types of hospitals services, and at a range of scales, can be generated from the results. The emphasis in this paper is on method and the usefulness of the results rather than on the interpretation of the results that the method produces. The accessibility of hospitals in New Zealand may be useful to New Zealand policy analysts but is not important for an international audience. What is important to the latter group is that a method for calculating physical accessibility has been described and demonstrated to be useful. This method could be applied to other countries that have available the necessary input layers. The network analysis has produced new information previously unavailable at a national scale in New Zealand. The data resulting from these analyses consists of 38,000 Census points that contain both travel distance and time information plus all the demographic information from the population Census. This method has shown that physical accessibility to hospitals varies considerably throughout New Zealand. There are 167,295 people in New Zealand that have to travel more than one hour to visit a basic public hospital and many of these people are located in the southern and northern regions of New Zealand. The locations of these people can be mapped to the most detail census enumeration districts that are publicly available in New Zealand. The results from this analysis may lead to new hospitals being developed or the upgrading of medical centers to hospital status in areas where access is currently poor. The regional and national aggregations, such as average travel times and population more than one hour from a hospital, are affected by the population distribution with the regions. If the population is evenly spread across a region and the hospitals are centrally located then average travel times can be high, while if the populations are concentrated around where the hospitals are located then the average travel times are low. 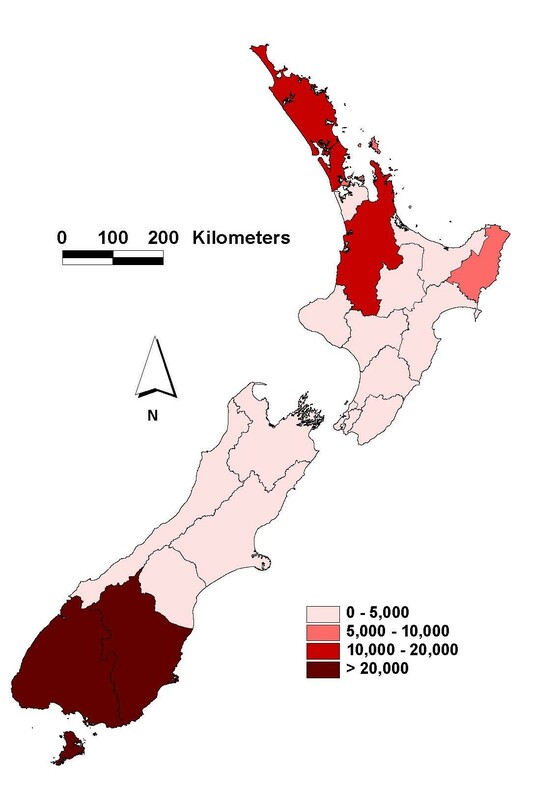 The characteristics of the population distribution within a region vary considerably throughout New Zealand and are related to the dominant landuse in a region and traditional settlement patterns. In some regions the population is dominantly rurally located while in other regions the population is more urban based. For this reason there will always be interregional variability with access to hospitals. Geographical access models have enormous potential for informing policy development and grounding debate on how to achieve social equity of hospital access. These models are a potentially useful information resource that can be used in health service delivery planning and assessment. Network analysis using road travel times produces more accurate models than straight-line distance models because we know that people generally use road networks rather than travel in a straight line. The ability to calculate travel times for a large number of population enumeration points provides a rich information source that can be tabulated for different management zones and population groups. The travel distance and time results provide opportunities for future research. The relationship between hospital accessibility and utilization can be explored. In New Zealand, information on every patient that utilizes public hospitals is recorded, including their illness and home location. For some illnesses, such as asthma and cardiovascular problems, accessibility to hospital services can be critical to patient survival rates. Some patient, such as diabetics, may need regular hospital visits and whether travel time influences the regularity of these visits could be explored. As stated in the introduction, accessibility has many dimensions. There can be a difference between actual and perceived accessibility and it is important that this difference is monitored. The physical accessibility results derived from this study could be compared with qualitative public perception studies of perceived hospital accessibility. This study shows that GIS can be used to assess accessibility over large networks using thousands of demand points and 63 supply points. This research has raised the awareness within the policy environment about the potential for network models to provide quantified travel time and distance data for other health services, such as mental health centers, General Practitioners, Eye specialists, and Oncologists. Greater emphasis is now being put on the need to maintain geographical databases relating to such services. This research has been funded by Public Health Intelligence, which is part of the Ministry of Health, New Zealand. The computer analysis was conducted at the Department of Geography, University of Waikato. The authors are grateful to both these organizations for their support. We would also like to thank Ron King, from the Ministry of Health, who assisted in reviewing the analysis results. Both authors contributed to the initial conception of this research project and in the writing of this paper. Lars Brabyn conducted the GIS analysis. Chris Skelly organised the collection of information on hospitals.